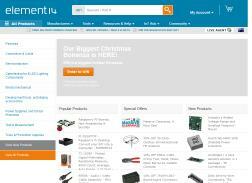 element14 is a powerful eCommunity, technical portal and online store. It offers electronic design engineers, maintenance and repair professionals as well as purchasing officers secure access to the information, software, tools and products needed for their businesses. Save 10% when you spend over $500. Get 10% Off orders over $149. Not available for customers who are already receiving special pricing. Get 51% Off on Portasol Soldering Iron, Gas. Get Free Delivery on orders over $45. Get 20% Off all Tenma. Expires on 02/25/2015. Get 10% off stocked products. Up to 74% Off Connect Super Sale. Expires 07/27/2012 or while stocks last. Get 40% Off on Lindstorm – 8130 – Cutters, Side Semi Flush 108mm. Get 10% Off Sitewide. Expires on 01/23/2015.